The collection is made up of a diverse range of creative talent, including French Fashion House ‘Each x Other’, to Italian mixed media artist Rebecca Coltorti, Spanish illustrator ‘Pablo Thecuadro’, and fashion photographer ‘Erika Astrid’ from Germany. The exciting collaboration sees leading fashion and design influencers from all over Europe create a range of unique designs that can be uploaded to Sony’s newly launched fashion watch, FES Watch U, at the touch of a button. 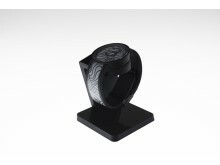 The FES Watch U utilises e-Paper technology so wearers can change the surface pattern on the watch using the FES Closet app. FreddieMade (UK), Erika Astrid (Germany), Pablo Thecuadro (Spain), Rebecca Coltorti (Italy), and Each x Other (France), have all been meticulously chosen for the partnership by Sony and Hunger Magazine as leaders in their categories, each bringing a distinctive flair to the collection that reflects their personal style. FreddieMade is a London-based freelance creative whose aim is to have fun with clients and brands that have a story to tell. Specialising in concept, direction and design of content for digital and social, he is also the Conceptual Art Director at CULT LDN. The FES Watch U won the world renowned iF DESIGN AWARD 2018 and Good Design Award of 2017 in Japan. The new FES Watch U is available now in the UK, Italy, France, Germany and Spain. It is available in silver or black and is priced at approximately £529 / €599 and £699 / €799 respectively. 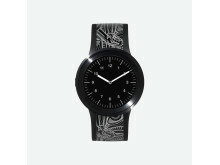 The FES Watch U is the only one of its kind in the market, and aims to bring together fashion and technology to allow people to express themselves in the most individual way. 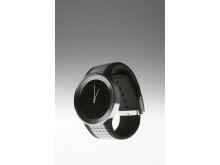 The award-winning watch uses active matrix flexible e-Paper in both the face and strap to allow the wearer to fully customise the design of the watch to complement their fashion, mood and attitude. Designs can differ on both the face and the strap, giving the user the ultimate personalisation experience and creating one-off unique design combinations. A range of over 100 different pre-loaded greyscale designs is available in the dedicated ‘FES Closet’ app for wearers to choose from. The designs created by each of the fashion and design influencers will be available for wearers to download and wear from 26th November 2018. 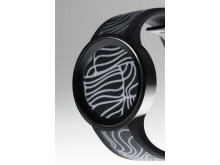 Users can also personalise the watch by creating their own unique design for both the face and strap of the watch, giving the wearer full creative control over their accessory. 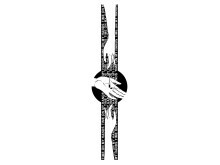 Each x Other - is a Paris based clothing brand and publishing house with the ethos of “Art Meets Fashion”. The brand was created in 2012 following the encounter of fashion designer and entrepreneur Ilan Delouis and artistic director and gallery owner Jenny Mannerheim. Having complementary skills and know-how the duo decided to create a concept that honors the culture of fashion and art, fusioning the two disciplines in order to create a brand at the crossroad where art meets fashion. FreddieMade - Freelance creative having fun with clients and brands that have a story to tell... Specialising in concept, direction and design of content for digital and social. Erika Astrid - Artist and photographer based in Brooklyn, NY, born and raised in Germany. Erika is interested in the space where photography meets the realm of abstract art. Painting is a major outlet for the creative, and an inventive tool within my photography. Pablo Thecuadro – Madrid-based artist and photographer Pablo Thecuadro uses fashion editorials, some photos shot by himself some shot by other photographers, to create something new. He crafts abstract art by cutting given picture composition digitally as well as physically and in this way builds an extraordinary imagery. Thecuadro breaks away from viewing habits in fashion industry and advertising. Rebecca Coltorti - is a Mixed Media Artist, based in Italy. The 23-year-old, with a combination of art and graphic backgrounds, has found the perfect world to express her creativity in the fashion business. Her passion for traditional techniques (collage, drawing, painting) mixed with the digital ones, leads her work to something always unique, bold and eye-catching. Hunger Magazine are fast evolving and expanding. Constantly widening our reach, we are continuing to collaborate with the best of photographers, stylists and creative minds and have an extensive and active social media network to engage and interact with our readers. However, at our core, we remain the same: fascinated by people, fashion, music and art. We are excited by the new, and mindful of the established.